Situated in a pristine setting, you will be enchanted from the moment you step into this ten room, four bedroom, four bath, custom built, hand crafted home. Architecturally designed, creating a wonderful casual elegance from the open, inviting kitchen & dining area with high end appliances. This home is a great value. Approximately 4500 square feet of open living space with magnificent views from many of the rooms. 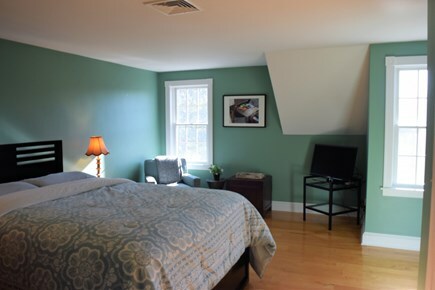 Three large bedrooms all with private baths and a fourth room with 2 twins. Library with Sleeper sofa. Sleeps 10. The appliances are upscale and the furniture and bedding are brand new and high quality. There is a pantry and French doors leading to a private brick patio. From the patio, enjoy views of your own pond where the great heron visit and rolling stone walls create the perfect landscape. 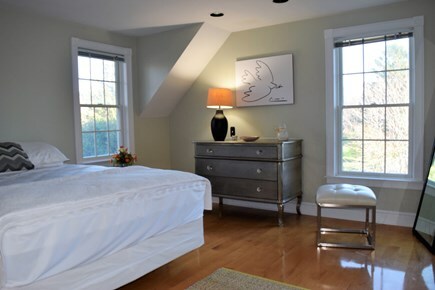 Decorated In a zen style, there are new, upscale and comfortable furnishings and beds in all rooms. We have been visiting the Cape for many years and recently purchased this home when we fell in love with the town, neighborhood and setting. 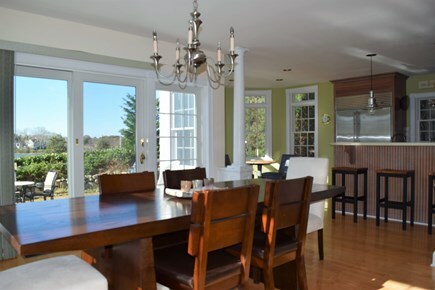 The town is magnificent with great restaurants, theater and so close to swimming at Dennis Pond or Yarmouth Port and Dennis beaches. You will love this house and the location!!!! There is a small beach just down the road and great town beaches and lakes close by. You can walk to town and find great restaurants, an old fashion homemade ice cream shop and an excellent cafe (Optimus cafe) for breakfast and lunch. All this and just a very short drive to Hyannis and shopping. Additional availability info: more pics available ... This is a Saturday to Saturday vacation rental. 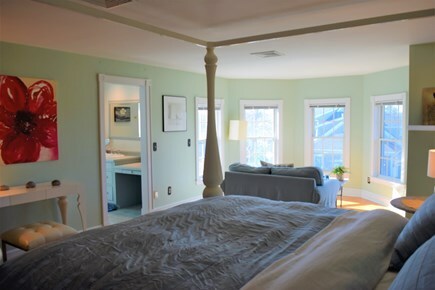 Long-Term Rental (1 month or more): October - May Winter Rental for $4,000 per month. This house is an absolute dream! My family and I stayed here in late August. Unfortunately, the weather was uncooperative for the beginning of the week. Thankfully this spacious home left plenty of areas to read independently and/or gather together for games/socializing! The house was super clean when we arrived, it is evident that the owners keep up with this property. Although it is a quiet area of Cape Cod, there are still plenty of dining options within a 10-15 minute drive. 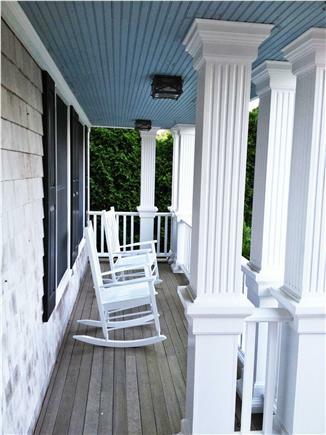 This property is not walking distance to an actual beach, but the views of the marsh and water are relaxing. There are several beach options within a short drive. There is a spacious side yard that our young daughter enjoyed! It was nice to have some chairs (no table) for sitting outside to enjoy the weather when possible. We spent a lot of time in the Kitchen, which was great for gathering and the high end appliances were a great touch for preparing and storing food! The owner, Jeff, was quick to respond my emails, before and during our trip. We had a wonderful week. We managed to hit 3 local beaches, the inflatable water park, 3 local ice cream shops, a sunset at Grey's Beach, and ate at almost all of your casual recommendations (plus 2 nights of Inaho take out!). We went to PTown for a day and Nantucket for a day. The weather was magnificent. We were greeted by a family of baby bunnies all week on your front lawn. The kids religiously played wiffle ball in the yard at dusk and there were many sunsets viewed on your back porch. This lovely vacation rental checks all the boxes! 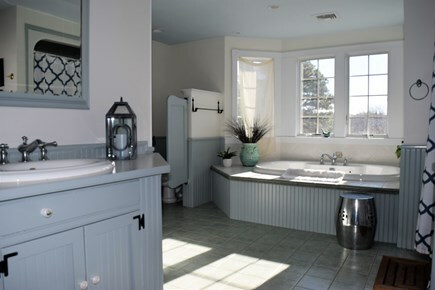 We recently vacationed at this beautiful home located in a quiet and tranquil area close to bayside beaches. The house itself was spotless and tastefully decorated. 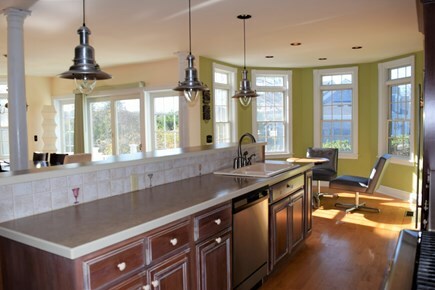 We were looking for a relaxing vacation home that the whole family including our older teenagers would enjoy. This home did not disappoint. 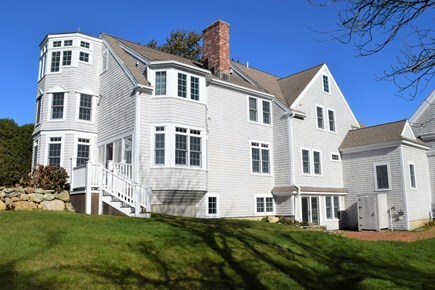 We enjoyed all that this home had to offer including short stroll to neighborhood beach, central air, luxurious bedding, and terrific sunset view over salt water pond from the back patio. 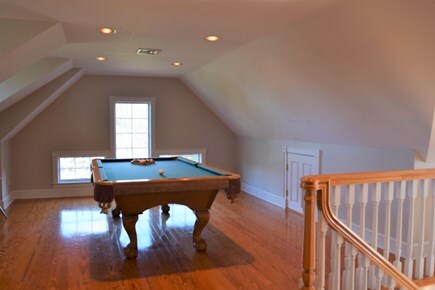 A game room which includes a pool table, air hockey, and foosball table was also a big hit with my husband and kids. We would definitely recommend this vacation home to anyone who is looking for a quiet retreat. The most beautiful vacation home in perfect location! We decided to take a two week vacation on the Cape this year and chose this house for our stay. We were so pleased with our decision. This was such a beautiful house. Clean, spacious and a great location. A great neighborhood for long walks withe the kids. Close to everything my kids love to do on the Cape. There is a wonderful pond nearby that my kids loved to just go and take a dip later in the day. The nearby beaches are also beautiful. Amazing Home - Great Location! Vacationed here last week with our 4 kids (ages 13, 12, 11 and 8) and we all had a grand time! 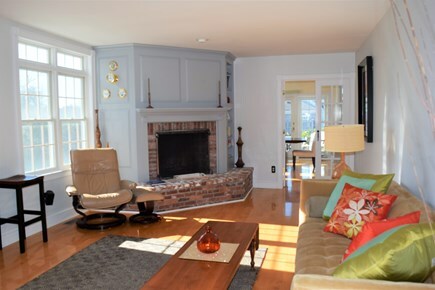 The house is lovely, clean, spacious and decorated tastefully. 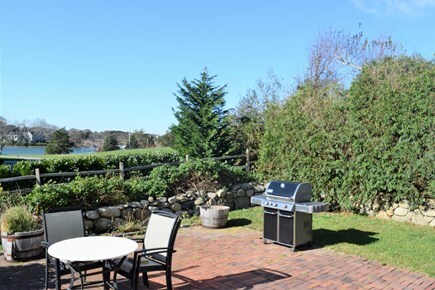 There is a beautiful yard complete with those famous Cape Cod hydrangeas, a farmer's porch, and a back patio where we enjoyed watching the sunset over the water. Kitchen is fully stocked with dishes, glassware, utensils, pots and pans, and nice appliances to make cooking meals easy. Of course, we barely used it because there is a plethora of fabulous restaurants close by! 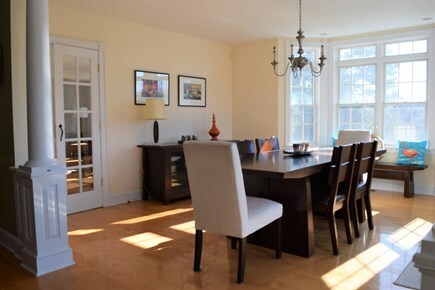 Quick and easy access to restaurants both in Yarmouth Port and in the surrounding towns (you can even walk to a few). Peaceful neighborhood with minimal traffic - perfect for those who like to walk, jog or bike. So many great beaches to choose from in the area - we tried several! Outstanding Home and Setting!! Terrific and fun place for the whole family! 5 stars! We had a wonderful time staying in this gorgeous home. The home itself is stunning and spacious. It is extremely clean and has lots of room to spread out. The game rooms upstairs provided hours of entertainment for the young kids and young adults in our group - the pool table was a highlight of the trip! The location is great. The neighborhood is quiet and provides the perfect spot for morning runs, walks or a bike ride. There is even a perfect spot for crabbing within walking distance. The kids loved this activity! 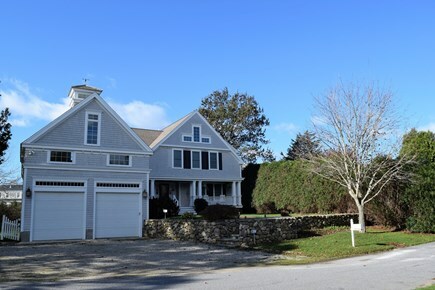 The home is also very close to Route 6A and you can access the rest of the Cape easily from this spot. We found many gorgeous beaches within a short drive, great restaurants and tons of family fun!